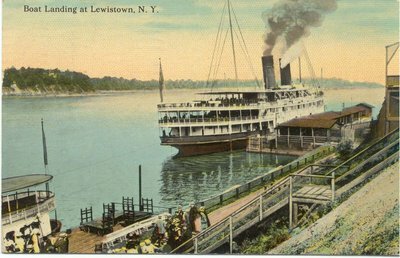 Coloured postcard of the Niagara Navigation Company steamboat CAYUGA at the landing in Lewiston, NY. The stern to the left of the image is either CHICORA or CHIPPEWA. Divided back. Postmarked "Buffalo, NY, 18 Jun 1912, 11 pm"
Reverse: "This space for writing messages" "Post Card" "This Space for Address only" "A-24678"